The first North American national tour of “Charlie and the Chocolate Factory,” based on the beloved Roald Dahl children’s novel, is at PPAC through Sunday, and in short, it’s the best parts of every adaptation so far rolled into one. The musical, by David Greig and Marc Shaiman and directed by Jack O’Brien, has been overhauled since it debuted in London, but the story remains the same. Charlie Bucket, who is so poor his four grandparents have to share a bed and his home doesn’t have electricity, lives in sight of the most glorious and secretive chocolate factory known to man. 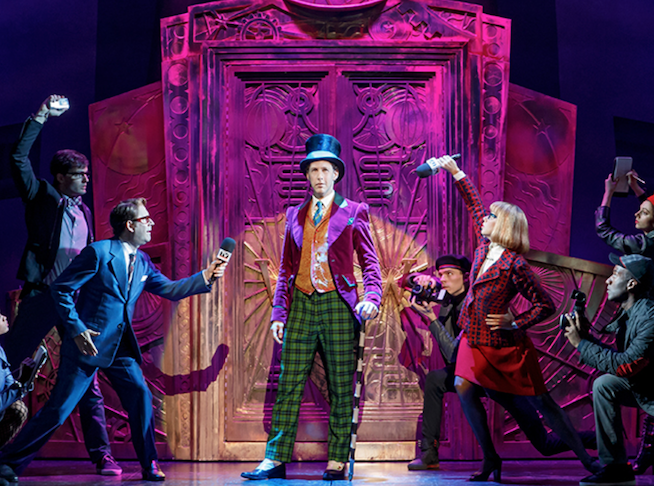 When the owner, Willie Wonka, announces five lucky winners will get to tour the place for the first time in decades, Charlie knows that he doesn’t have much of a chance. But against all odds, he gets to join four very spoiled and ridiculous children for a once-in-a-lifetime opportunity. And, in the spirit of a true morality tale, everyone gets what’s coming to them. The musical features a few of the songs from the movies (“Pure Imagination” and “The Candy Man Can” being two of the big ones, but there are also references to the original Oompa Loompa ditty) and a bunch of new tunes. The children have been modernized (Violet Beauregard is an Instagram superstar; Mike Teavee is now the king of portable electronic media and his mother’s song, one of the funniest in the show, mentions all kinds of present-day pharmaceuticals), though Charlie is still buying rotten cabbage out of a shopping cart on the street for seven cents a head. The sets are a mix of the familiar sights from the movie (and there are definite Tim Burton-esque moments, including a wildly surreal Russian ballet with giant squirrels) and drawings from the book, combined with some pretty stellar projections for the proscenium. In terms of production values, it’s another hit. The effects that utilize more advanced technology are smooth and the more rudimentary ones are old-school theater done right. There are many good examples throughout the show, but the real standouts are the Oompa Loompas. No spoilers here, but the way they’re handled is nothing short of genius. And, as if the writers sensed the country could only handle one orange clown at a time, they’ve lost the citrus look entirely. The cast is vocally strong overall and the acting is pretty on point, especially considering the ages of some of the cast members. Charlie Bucket is a demanding part, but Collin Jeffrey, who shares the role on this tour, does the character justice and is just the right amount of kind without being smarmy. He has a strong voice, as does Benjamin Howes, the actor who played Willie Wonka on press night. Normally that role is played by Noah Weisberg, but Howes certainly carried the show just fine. Howes while in costume looks just enough like Gene Wilder to add a nice sense of nostalgia to his Willy Wonka and his voice is outstanding. Jessica Cohen as Veruca Salt is a stunning dancer and excellent at acting like a spoiled brat– it’s not her fault that her character is absolutely reprehensible. This is being billed as a family-friendly production and children of all ages are welcome. If you are looking to introduce your children to the world of professional musical theater, Charlie and the Chocolate Factory is just the (golden) ticket. Charlie and the Chocolate Factory runs through Sunday, Feb. 10, at the Providence Performing Arts Center, 220 Weybosset St., Providence. Tickets start at $51 and may be obtained online or by calling 401.421.2787.